Home > General News > What are Grain Mites? 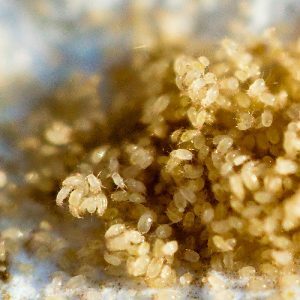 Grain mite, also known as flour mite, is one of the many species of mites that infest grain, flour, seeds, bulbs, cereals, dried vegetable materials, dried corn, cheese, wheat germ, powdered milk, and other food stuff. They are found across the globe and they usually require high moisture condition to proliferate and cause severe infestation. They are too small in size to be noticed but, when present in large numbers, they can be seen as a brownish tinge over the food grain. The infested products emit sweet, minty odor. Grain dust and minty smell are the first noticeable signs of a grain mite infestation. Grain Mites (scientific name: Acarus siro/ A. Siro) are pale, grayish white colored mites with yellowish to reddish brown legs. The male mites measure 0.013 to 0.017 inches, whereas the females are 0.014 to 0.026 inches long. They are soft-bodies, wingless bugs having 8 legs. Each leg has a claw at the end. During their larval stage, flour mites have 6 legs but, as soon as they enter their nymphal stage, they develop their last pair of legs. Grain mites do not live for long. Their life cycle may be as short as 9 days to as long as 28 days, depending on humidity and temperature. With 90% humidity and 77 degrees F temperature, this bug will be able to complete its life cycle in just 9 to 11 days. If the temperature is between 64-71 degrees F, it may require 17 days and if the temperature is 50-60 degrees F, the life cycle would be about 28 days. Their life cycle starts with an egg. The female grain mite can lay up to 800 eggs on the surface of the grain over a period of a few weeks. Once the eggs are hatched, the mites will enter their larval stage, where they will have 6 legs. Soon, most of the larvae will molt into fully grow adult with eight legs. However, some larvae may enter into a non-feeding ‘hypopus stage’. During this stage, they will develop suckers on the underside of their body. These suckers will help them attach themselves to their living carriers such pets and other insects or anything moving such as a box or a bag that will help them to reach a new location. This hypopus stage is responsible for resurgences, as they are highly resistant to insecticides and can survive even strongest chemical treatment. 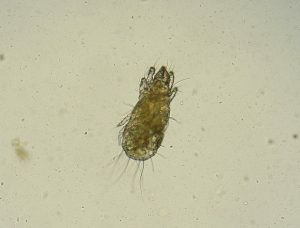 Grain mites are found across the globe. They can survive and proliferate in any country or region where their favorable conditions are met. They proliferate rapidly in humid conditions. This is the reason why grain mites are found in large numbers during late summer. Coastal regions with higher humidity are more prone to grain mite infestation than the drier inland region. Similarly, grain and food products with high moisture are more prone to infestation than the dried ones. Most adults will stay put as long as food source is available. However, they may start moving off in search of food when there is overcrowding. Moving grain and grain dust on shelves, food bags or counters indicate their presence in heavy numbers. Unfortunately, mite dust is seen only when they have started moving off in search of new food, which means they have already heavily infested something. Infested food will emit a sweet minty odor, which is another noticeable sign of their presence. Grain mites can contaminate the grain with allergens, thereby causing allergic reactions in some people. These mites are also responsible for spreading fungal spores into the grain mass and adjoining bins. When bitten by grain mites, a person may suffer from Baker’s itch or grocer’s itch. The mites emit a non-pleasant, minty odor, which causes severe discomfort and breathing problems to factory workers and anyone who has to inhale the odor for a long time. Good hygiene practice can help you stay away from grain mites as much as possible. If you store your food grain in a clean, dry and well-ventilated place, you will probably never have any trouble but if you do see grain dirt or moving grain particles, contact your nearby pest control company immediately. I need help identifying a pest that I was told was a flour mite, however when I research images of the aforementioned there is little to no resemblance to what I have captured in a photo through my phone. Can someone advise me?